I have, of course, been going into great detail to explain the relationship between Highmark and MedExpress, and to lay out what appears to be the Highmark plan for establishing a monopoly on health insurance and even health care in Delaware. This is apparently worrisome to some of the leaders of Highmark Delaware, who appear to have become new followers of this blog, like President/CEO Timothy Constantine and (this title is not only a mouthful but quite unintentionally revealing) Senior Vice President for Provider Strategy and Integration Paul Kaplan. Well, I always welcome new readers, even aggrieved new readers. It is important right now to step back and take an even broader look at the overall Highmark empire, to include specifically the parts of that empire that impinge on Delaware. I will warn you at the outset that this is a long, LONG post, but if you actually care about free-market competition, monopolistic business practices, or government corruption, you need to read it all. By the way, as I was doing the final editing on this piece I discovered that I was wrong. Highmark actually owns AT LEAST 35 subsidiary (and mostly for-profit) companies. If you want to get a real glimpse of how Highmark reports its own strategy, you really have to look now further than Visionworks, which is now the largest American-owned chain of optometry stores, and second in size only to foreign-owned Lens Crafters. Visionworks is the name that eventually will be taken by all 600 or so of the retail vision outlets that Highmark operates across the United States. It's also the name of the Texas-based corporate entity that operates the retail units (the company used to be called the Eye Care Centers of America Inc.). By November, each of the separate 15 brands (EyeMasters, Binyon's, Hour Eyes, Dr. Bizer's VisionWorld and many more) that were acquired over the years by Eye Care Centers of America will have been rebranded, said Jim Eisen, president of Visionworks. It was a long process, but "in order to really grow into a national brand, you obviously have to have one name," Mr. Eisen said. "We are going to continue to grow stores and open stores." Plans are to open 36 or so Visionworks locations this year, and 70 to 90 more in 2014 and beyond. Eventually, Highmark's Visionworks will have a retail vision presence in 46 or 47 states, Mr. Eisen said. By "fully integrated," Highmark means that its for-profit vision wing, Highmark Vision Holding Company Inc., controls all components of the eye business -- from the insurance company, Davis Vision Inc., to the retail clinics, down to the optical manufacturing centers. This year, the company is opening a new lens and frame manufacturing center in San Antonio, its fifth manufacturing and distribution hub in the U.S.
"We're creating a product, end to end, from manufacturing all the way to the retail sale," said William Winkenwerder Jr., Highmark's CEO. The spread of Visionworks into the Philadelphia area has long worried local independent opticians, who say they already operate at a competitive disadvantage because of rules they must follow to be in the Davis Vision network. Davis Vision, which is also owned by Highmark, is the region’s largest vision benefit management company. Davis Vision also operates an eyeglass manufacturing plant in Newtown Square, and requires independent opticians to use that plant when ordering eyeglasses for Davis Vision members. One area optician, who asked his name not be used, said the addition of the Visionworks stores will create an even more uneven playing field for the independents. He said when dealing with Davis Vision members, who make up about 60 percent of his business, he will still be required to place orders for glasses to be made at the Newtown Square plant — a process that takes days to get finished product to his customers. Visionworks, he said, promotes its ability to provide one-hour service on most prescriptions by using on-site processing laboratories. Are you getting this? It is exactly what I have been telling you about the Highmark-MedExpress relationship: Highmark as the insurer (Davis Vision) provides preferential services to its own subsidiary (Visionworks) that are denied to independent local opticians. Let's go further and ask about United Concordia, Highmark's for-profit dental insurance company. United Concordia recently lost its Tricare (US Armed Services personnel and their dependents) contract that it had held for fifteen years. There are two takeaways here. Terrible- Avoid!My wife called to get information. The rep was confused and it seemed she was purchasing dental insurance for me. I was on active duty (military) and there for it was activated for her. I went to the dentist and now I have to pay for the bill instead of the insurance covering it. The service doesn't help her because she is over 23 and can't get any type of orthadontic work. We can't cancel for a year. retired U.S. government workerWhy the U.S. government allows this company to sell insurance to government workers is beyond me. They totally misrepresent the program. They told me that I should read the fine print that says they have limitations and exceptions to what they will pay and it is complex and difficult to determine what they will pay but it is determined by their board of directors. DO NOT GET THIS INSURANCE!!!! i have had to submmit claims over and over again, because UC keeps denying my coverage. i paid $1000 out of pocket in my last treatment and UC was nice enough to reinburse me $168, they are a rip off. "military friendly" i think not! Government work is an important part of Highmark's business model. In addition to the Department of Defense contract, Highmark also has a Medicare processing deal and holds a variety of state contracts. Highmark Inc. is selling its lucrative Medicare processing business to a Florida-based Blue Cross Blue Shield insurer to quell federal officials' concerns that its purchase of West Penn Allegheny Health System would represent a conflict of interest. Highmark is already the Medicare administrative contractor for Pennsylvania, New Jersey, Maryland, Delaware and the District of Columbia. Although Highmark is best known as a commercial insurer, much of its annual revenue comes from its side businesses, which include servicing contracts and administering policies for the federal government. In addition to its Medicare processing unit, Highmark makes money selling Medicare supplemental policies, collecting $360 million in Medicare supplemental plan premium business last year. It also saw $660 million in direct-business premium revenue processing benefits for federal employees and families of soldiers, and it reported $1.5 billion in other Medicare-related revenue. Highmark Medicare Services serves about 4 million Medicare beneficiaries but does not include those in Medicare Advantage or Highmark supplemental plans. "West Penn [Alleghany] is only a small part of our strategy going forward," David O'Brien, executive vice president of Highmark, saying the insurer is in active discussions with physicians, hospitals and other providers "to expand our footprint in the provider world." That does not necessarily mean that Highmark is trying to purchase physician practices, he said. "We hope that a lot of providers will stay independent." Thursday's announcement prompted a quick response from UPMC spokesman Paul Wood. "Highmark's acknowledged lack of impartiality processing Medicare claims are exactly the same conflict of interest concerns UPMC has with Highmark if there were a commercial health insurance contract once the current one expires, the West Penn Allegheny acquisition is finalized and Highmark completes its grand vision of building a new provider system." In other words, KWS brought Highmark to Delaware because it had the potential to be a monopoly. Not for KWS and Delaware the rough-and-tumble of a competitive market. Nope. We wanted to bring in the largest possible gorilla with a track record of running roughshod over any possible competition. Why? Because KWS actually thinks that creating monopolies makes prices to consumers go down? Yep. Sure. But remember, please, that the top leadership of BCBS Delaware did not change when Highmark came to town. Receiving that $175 million write-off as a sweetener, Highmark kept President Tim Constantine around--you know, the local guy. 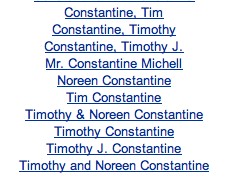 Forget Mr. Constantine Michell, who appears to be a different person, and just take a gander of of the Constantine household's campaign giving. I haven't yet tracked PACs associated with Highmark, but trust me, I'll get around to it. The complete irony here is that most of my liberal friends are always talking about how the "for-profit" insurance companies have ruined health care in America. But guys, Highmark is a non-profit corporation. It says so right on the label. Ignore the seven figure salaries paid to top management of this non-profit. Ignore the seven or more for-profit subsidiaries. Ignore the massive profits on Medicare processing and Medicare supplemental insurance. Ignore the monopolistic practices that mark virtually every element of the Highmark business model. They are a non-profit. They're the good guys, right? And they are slowly digesting the tiny state of Delaware because, after all, they've paid for it. Last note: apparently 2012 was a so-so year for Highmark. Revenues were DOWN to about $15.2 BILLION. Or put it this way: KWS and the General Assembly hocked the State of Delaware health care system to a non-profit corporation that took in revenues equal to more than four times the ENTIRE state revenues of Delaware. Oh, and that non-profit corporation reported a PROFIT of over $444 million. Tell me again exactly how this profit/non-profit thing works. Keep sharing interesting stories about it. We are looking forward to see more about it soon. Have a nice day.